Question: How to write conditional statement in CSS? Question: How to write styles for all html elements of the same type? Use tag name to write the CSS. Question: What are different vaules of position attributes? Question: How to display a link without underline using CSS? Question: How to display a link without underline when mouseover on the link using CSS? Question: How to page break after an html element in CSS? Question: What is the default value of "position" attribute in css? Question: How we can specify more than one css class for any HTML element? Question: Is CSS case sensitive? Question: What is ID selector? ID selector is an individually identified selector to which a specific style is declared. Question: How to set wait cursor? Question: What is Tweening ? It process of generating intermediate frames between two images to give the appearance that the first image evolves smoothly into the second image. Question: What are Child Selectors? A child selector is used when you want to match an element that is the child of another specific element. Contextual selector addresses specific occurrence of an element. 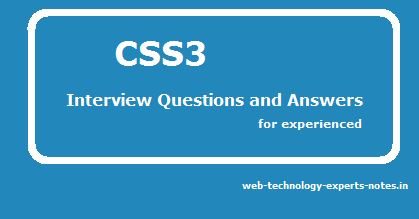 CSS3 interview questions and answers for experienced. CSS Interview Questions and Answers.